The Stage PRO KB200M Universal Boom Clamp is an essential tool for anyone needing to solve mic placement challenges creatively. 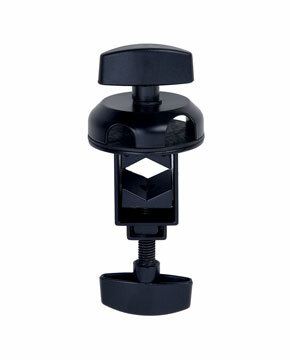 A unique two-piece clamp will accommodate tubes from 1/2 to 1 inch in diameter. Positioning the clamp couldn't be easier thanks to the simplicity in separating the two clamp halves - one half is the clamp adjustment assembly and the other half houses the boom adjustment assembly. Long and short booms can be easily inserted, removed and adjusted (a full 360 degree circle) without losing the clamp position. The boom assembly will accommodate the two standard boom diameters of 1/2" and 5/8". Mic'ing amplifiers, drums, cymbals, instruments or voice from all kinds of positions is easily accomplished with the Universal Boom Clamp. Attachment to any type of stand or leg gives the performer, producer, or sound engineer infinite options. The professionals can carry multiples to prepared for any possible challenge with the Stage PRO KB200M Universal Boom Clamp.